I recently posted a story on my personal Instagram account about a tiny lamb that came into my care. Flossy was weak, cold and very sick when one of our workers brought her to me. I immediately wrapped Flossy in a warm blanket and feed her some milk. Over the next few days I noticed Flossy was blind in one eye. I treated the infection and she was straight back in the garden, frolicking happily with Chester, another of my pet lambs. Shortly after posting about Flossy I received a message from Roz Harman. Roz reached out to ask if I would like a warm woollen jumper for Flossy. Since our initial conversation, Roz has sent me five jumpers for my pet lambs, which I am truly grateful for. It was a random act of kindness on Roz’s part and it really warmed my heart as well as my lambs! I was curious about the story behind Roz’s jumpers, so I reached out to find out more. Annabelle: Roz could you please tell me the story behind the woollen jumpers you knit for lambs? 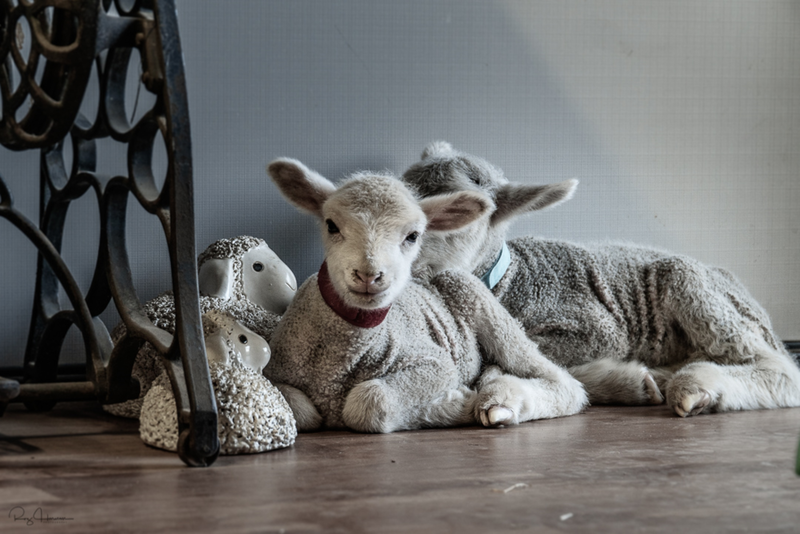 Roz: When our first lambs were abandoned, my husband and I had no clue about what to do. Luckily, we have an amazing neighbour who took on some of our lambs to help us. Unfortunately, she became unwell, but thankfully she had passed on enough information for us to do it ourselves. We changed the routine a bit and managed to save nine lambs out of 13. When we got them we gave them a couple of feeds of colostrum, a jumper each and then placed them in a cot to keep them warm as we were still getting frosts. The poo and wee situation was getting crazy because we were just letting them move freely around the house, that’s when we decided nappies had to be brought in. When they were big enough we built an enclosure on our veranda so they could still be close by. My husband built a nursery outside which is feral proof as all the lambs are still too young to head back out into the paddock. Annabelle: Roz I understand that you have not always lived in rural Queensland. How did you come to be where you are now? Roz: My husband and I have always loved animals. We previously owned chickens, ducks, turkeys and dogs when we lived in Brisbane. My husband and I have a joined family of five kids and when our kids moved on it was my husband’s dream to own a farm. I followed his dream because he had fulfilled all of ours through his hard work. It was now his turn, so we bought a farm in Leyburn and have been here for 11 months. Annabelle: What hardships have you faced as a result of the drought? Roz: We had big plans of growing our own produce as well as having livestock. It’s so dry, all we have is dust which means we can’t grow any pasture, so the lamb losses have been huge for us. Because we hand feed our sheep, the ewes just walk away from their lambs to come and eat. However, not all of them have done this. It has been heartbreaking for we have had to bury over 150 dead lambs. We only had 393 ewes. We are devastated by these losses for this was to be our income. Annabelle: Roz what has helped you get through these tough times? Roz: Knowing that we aren’t alone in this drought is of some comfort. Realising we’re not stupid, and that we’re just doing the best we can under such terrible conditions. I also love photography and taking photographs of the good, the bad and the ugly gets me through. I recently bought a drone so I can follow the sheep and take pictures. So far it’s been too windy and dusty to get it out. Through my photography I have met some amazing ladies that farm such as yourself. Just knowing I can message another farmer when a poddy is sick, or dies is a blessing to me. Annabelle: When the rains finally do arrive, and things fall into place, what are your hopes and dreams for the future? Roz: I hope that we can finally have the farm we’ve dreamed of and that we can grow pasture for our stock instead of handfeeding them. This would certainly make us smile again. The heartbreak has been crippling at times for both of us. I take my hat off to farmers who have farmed their whole lives. Annabelle: Roz I would like to thank you for giving me the jumpers off your own lambs’ backs, and for speaking with me. Roz: Annabelle it was my pleasure. I was just passing on some love that had been sent to me. 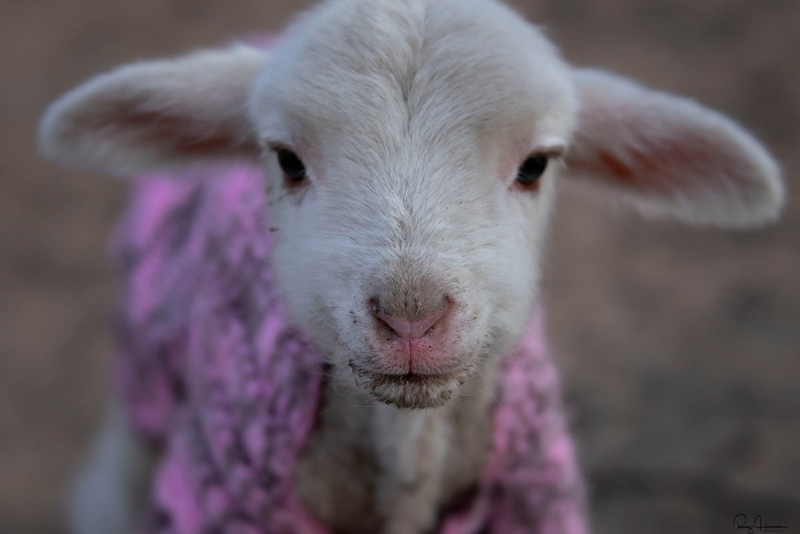 I know what it’s like to pick up a scared little lamb and want to make sure it’s warm and safe. Being a part of the farming family is a special thing.